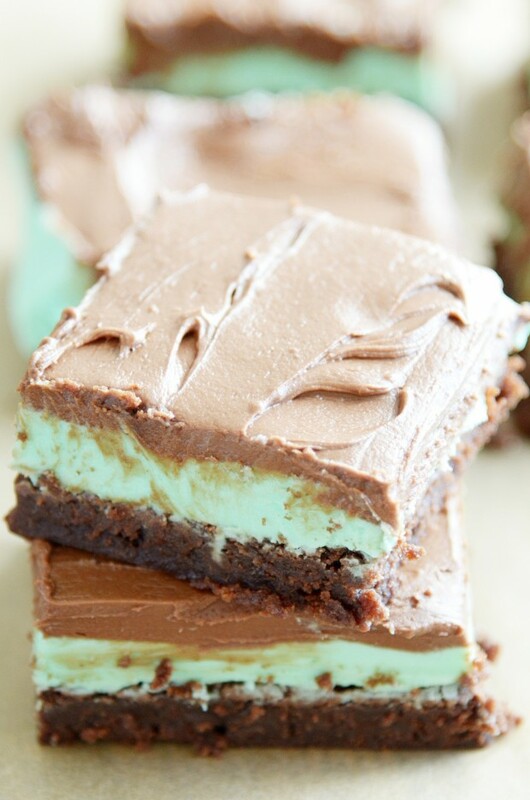 Extra fudgy brownies topped with vanilla mint frosting and creamy chocolate frosting. I have been in a total brownie mood for about 2 months. I mean, I’m alwayssssss in the mood for a brownie (see Brownie Cookies, Fudgy Brownies, Brownie Batter Dip, and Nutella Brownies just to name a few of the brownie recipes on this site). But recently, the craving has been a force to be reckoned with! I think it all started when my mom made our family favorite brownies with frosting. I am a total sucker for brownies with frosting. They make me go weak in the knees. So I made my mom’s brownies and photographed them and have them all ready to share with you… but not until a little later ????. I thought today called for something a little minty in honor of St. Patrick’s day! 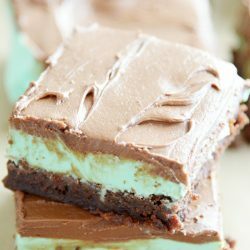 So I took my mom’s recipe and gave it a little twist by adding a layer of sweet vanilla mint frosting in between the fudgy brownie layer and the creamy milk chocolate frosting on top. I know, right? How about a little brownie to go with that frosting??? Seriously guys. I’m a frosting freak. Just gimme a spoon and watch me work! These are the fudgiest brownies of all time with the creamiest frosting ever. 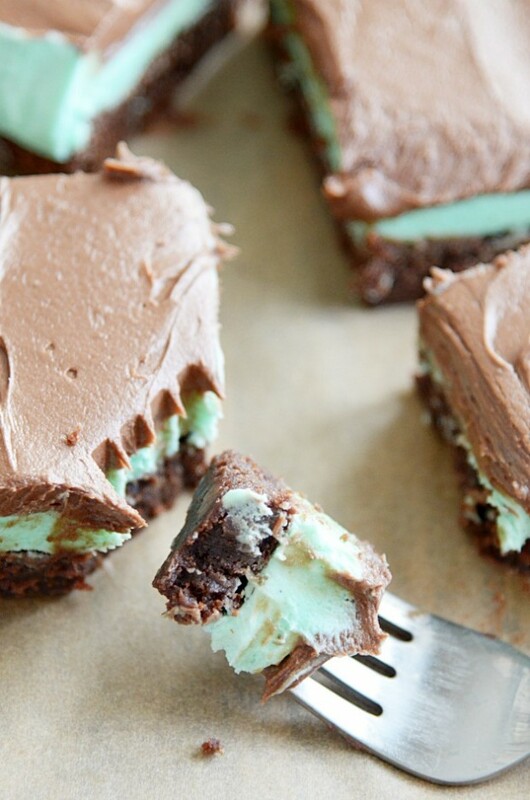 If you’re a mint chocolate fanatic, these brownies are for you!! Enjoy! 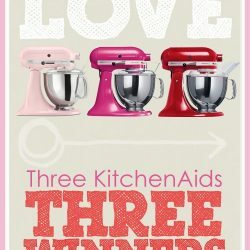 And lick the whisk for me ????. Preheat oven to 350ºF. Lightly spray and line a 9x13 baking dish (or 8x8 for thicker brownies, but adjust the baking time and half the frosting recipes). Stir together the brownie ingredients: butter, sugar, vanilla, eggs, four, cocoa powder, baking powder, and salt until batter forms (it's ok if it's a little lumpy). Fold in the chocolate chips. Bake for 20-25 minutes until the edges start to pull away from the sides of the dish. Make the mint frosting: use an electric mixer to beat the butter, powdered sugar, milk, peppermint extract, vanilla extract, and food coloring together until smooth. Cover and set aside. 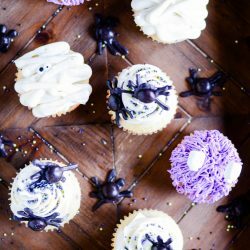 Make the chocolate frosting: use an electric mixer to beat the butter, cocoa powder, corn syrup, powdered sugar, milk and vanilla until smooth. Cover and set aside. 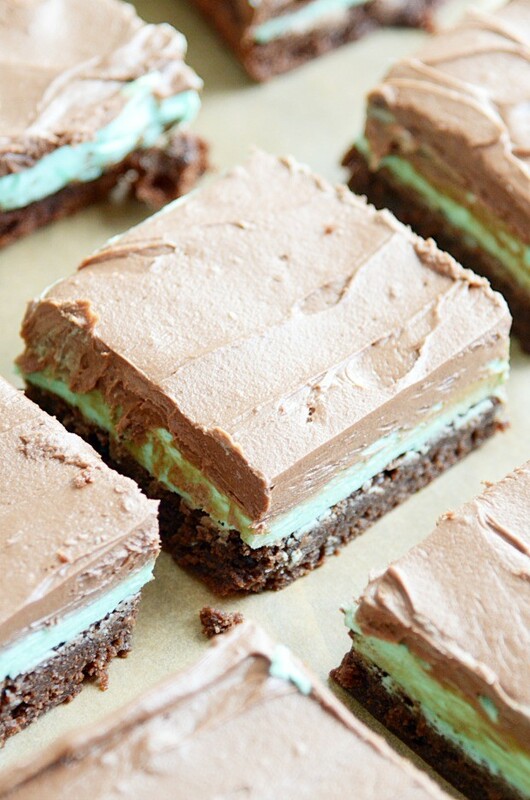 Spread the mint frosting over the brownies and then the chocolate frosting over the mint frosting. Cut into squares and serve. Best when chilled (in my opinion).